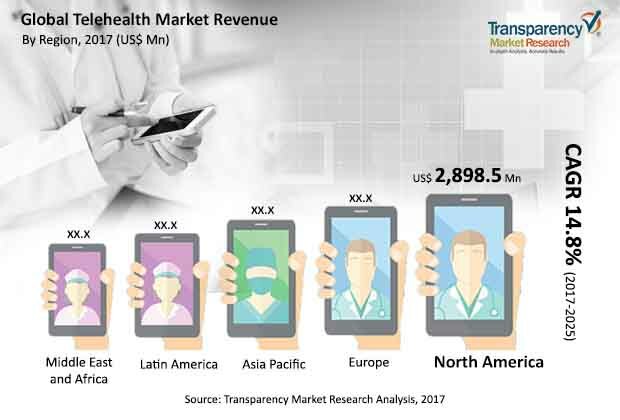 The report offers detailed segmentation of the global telehealth market based on component, application, and end-user. In terms of component, the services segment is poised to account for leading share of the global telehealth market during the forecast period from 2017 to 2025. Increase in adoption of remote monitoring solutions by patients in remote rural areas are the factors likely to drive the services segment during the forecast period. The software segment is anticipated to expand at a comparatively higher growth rate than the hardware segment in terms of revenue during the forecast period owing to continuous innovations in software by major players. The radiology segment is projected to account for high share of the global telehealth market during the forecast period. The segment is likely to expand at a CAGR of 13.0% from 2017 to 2025. Telehealth technology and services enable knowledge and resource sharing between rural and urban areas in minimum time duration. Moreover, consistent evolution in information and communication technologies, effective image transfer, consultation and reporting, and scarcity of radiologists across the globe are the factors expected to drive the segment from 2017 to 2025. Cardiology is another key application of telehealth and is anticipated to account for 19.0% market share by 2025. Increase in prevalence of cardiovascular diseases such as heart diseases and stroke are the factors likely to drive the segment during the forecast period. According to the World Health Organization, cardiovascular diseases accounted for an estimated 17.7 million deaths in 2015, representing 31% of all global deaths. Of these, an estimated 7.4 million were due to coronary heart disease and 6.7 million were due to stroke. In terms of end-user, the global telehealth market has been segmented into payers, providers, patients, and others. The providers segment accounted for major share of 50.0% in terms of revenue in 2016 owing to increase in adoption of telehealth products in health care settings and rise in partnerships between companies and hospitals for telehealth systems. The payers segment is anticipated to expand at a higher CAGR during the forecast period due to increase in adoption of telehealth and connected medical devices by insurance companies for insurance claim management. Geographically, the global telehealth market has been segmented into five major regions: North America, Europe, Asia Pacific, Latin America, and Middle East & Africa. In terms of revenue, North America is likely to continue to dominate the global telehealth market during the forecast period, owing to government initiatives to increase adoption of telehealth solutions, technological advancements, and efforts of key players to expand their market presence in North America. The market in Asia Pacific is anticipated to expand at a significant CAGR of 15.0% during the forecast period. Aging population, large patient pool suffering from chronic diseases, surge in demand to cut down health care cost, and improving health care infrastructure in countries such as India, China, and Australia are estimated to propel the telehealth market during the forecast period. The global telehealth market is highly fragmented in terms of number of players providing hardware, software, and services. The key players contributing to the growth of the global telehealth market include Teladoc, Inc., American Well, BioTelemetry, Inc., Medtronic, Aerotel Medical Systems Ltd., InTouch Technologies, Inc., Koninklijke Philips N.V., Honeywell International, Inc., GE Healthcare, and AMD Global Telemedicine, Inc. Focusing on inorganic growth strategies through various partnerships, collaboration, and expansions is the key strategy adopted by these leading players. For instance, in March 2017, GE Healthcare acquired Monica Healthcare, a monitoring technology company dedicated toward improving the birthing experience and enhancing obstetric care through wearable wireless fetal monitoring devices. Moreover, in January 2018, Royal Philips and American Well entered into strategic partnership to jointly deliver virtual care solutions across the world. Through this partnership, the two companies will work together to embed American Well's mobile telehealth services into an array of Philips solutions for both healthy consumers and patients with a medical need, spanning personal health & wellness, population health management, and clinical programs.